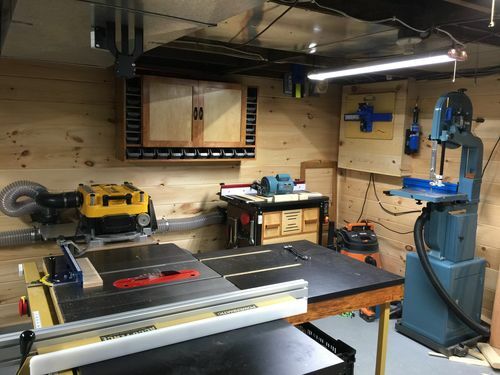 I have a small workshop in the unfinished portion of my basement. Right now it’s got sheetrock on the finished side of the wall and just studs on the unfinished side. I want to put up a sheet (probably) product of some sort to protect the reverse side of the finished space SR and to give me options for hanging stuff on the walls. In the past I have used sheetrock for my workshop walls but I hate working with the stuff and to hang shelves, etc you have to find a stud. I guess OSB is a cheap alternative but pretty ugly – even when painted. Any ideas? Sheathing plywood (RTD or CDX), T1-11, MDO? More expensive than either drywall or OSB—but I think you could attach something without worrying about finding a stud. I used “car siding” or tongue and groove boards on my walls. Great for hanging stuff wherever. I like the woodshop look also. The car siding looks fantastic. It’s a classic look for sure. These are great options. Also, plywood siding is nice. And it comes grooved which could add some horizontal or vertical interest.